Corned Beef Stew is simply Nigerian Red Stew prepared with tiny pieces of corned beef instead of lumps of meat. You can also prepare it with minced beef if like me, you are not a huge fan of corned beef. Corned Beef Stew is most commonly used to eat boiled pasta (spaghetti, macaroni) but it goes really well with Boiled yam and Boiled Potatoes. My kids love it and it is a great way to get them to eat more meat. They usually abandon the lumps of meat in their foods. I prepare it with minced beef though. Tomato Stew is fresh tomato puree and the tinned tomato paste that has been boiled and fried to remove all traces of water and the sour/tangy taste of tomatoes. Please note that this stew does not contain spices or seasoning. It only contains tomato puree, then onions and vegetable oil that was used in frying it. If you do not like corned beef, use minced beef instead. 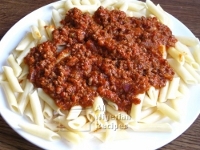 Minced beef is simply ground beef and can be purchased from all major supermarkets in Nigeria. The curry powder mentioned here is not the hot and spicy curry powder rather much closer to turmeric. We call it curry powder in Nigeria. If you already have Tomato Stew in your freezer, bring it out to defrost in good time before you need to use it in the recipe. 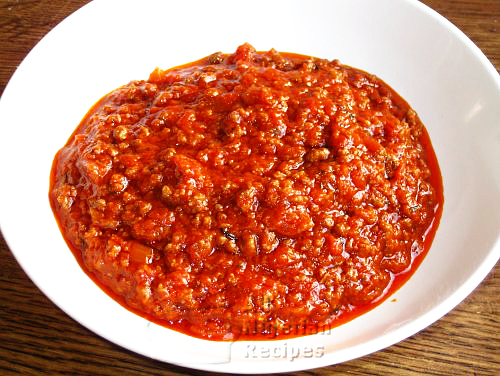 If not, prepare some Tomato Stew by following the steps at: How to Prepare Tomato Stew. Remember to pour out the excess oil when done. I usually prepare large quantities of tomato stew and store in my freezer. That way, I can prepare such Nigerian recipes as Corned Beef Stew in no time. All I need to do is bring out the stew early enough to defrost and food is ready in 15 minutes. Bring out the corned beef from the tin and use a tablespoon to separate it into small pieces. Cut the onions into tiny pieces. Pound the pepper (if fresh) or grind if dry. Start cooking the staple food you will serve with the stew: yam, rice, pasta or potatoes. Pour the vegetable oil into another (dry) pot. When the oil is heated, add the diced onions and fry for a bit. Add the corned beef or the minced beef and fry till the beef turns pale. Ensure you stir constantly so that the beef will not form lumps. Tiny pieces is the best..
Add the thyme and stock cubes. Add water to the same level as the contents of the pot and cook till the meat is done. This should take about 7 minutes on medium heat. Add pepper, curry powder, tomato stew and salt to taste. Stir very well, cover and leave to simmer and it's done! So so easy! Serve with the following staple food of your choice: Pasta, White Rice, Boiled Yam and Boiled Potatoes.